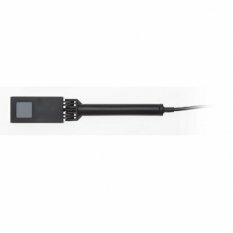 The PD300-IR is a photodiode laser measurement sensor for the near IR. It has a 5mm aperture with swivel mount and a removable filter. Without filter, its spectral range is from 700 to 1800nm and its power measuring range is from 5nW to 30mW. With filter the spectral range is 700 – 1800nm and the power range is 200µW – 300mW. The sensor comes with a 1.5 meter cable for connecting to a meter or PC interface.